Finally, your coolant needs to be fresh. Over time and miles, the anti-corrosion additives in the coolant are depleted and the coolant can actually start to eat away at the cooling system parts. Your owner’s manual and your Jenkins Auto Repair Professionals service adviser in Greenfield Indiana can help you with the recommended coolant replacement schedule and make sure you’re getting the right type of coolant. We see leaky water pumps and hoses in the Indianapolis Indiana area that need to be replaced, too. 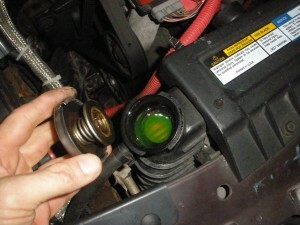 There’s also a part called the thermostat that opens and closes to regulate the flow of coolant. Sometimes they stick open or closed and the cooling system won’t work properly.